Before using these pads, we have to admit to being wholly sceptical. However, to us (perhaps not to an audience! ), there is a noticeable effect upon both our test drums. Makes your drum sounds feel more gutsy. Seemed particularly effective on the floor tom. As drummers we're always reliant on decent acoustic surroundings. So a helping hand at source is always welcome. American based company TNR Products has developed 'foam floaters', dubbed Booty Shakers, which its claims massively enhance low-end and increase resonance and sustain. 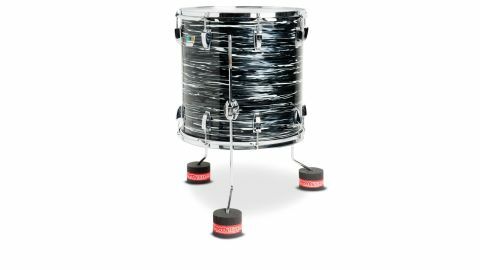 There are two basic products currently available; there are Booty Shakers for the floor tom and Little Booty Shakers for the snare and/or rack tom. "After a few hits we cannot detect any increase in resonance but the snare drum appears to be more gutsy"
Floor tom Booty Shakers are made from two layers of foam - the lower portion is extremely dense with a non-slip base, spreading the load of the tom foot over an 88mm diameter area. The top slice has a similar density to the foam found in studio sound-dampening and sports an aperture or 'slotted receptacle' where the foot of the floor tom leg is inserted. The Little Booty Shakers follow the L-shape of the rubber grips on the snare basket. The foam has the same high density as the lower slices of the floor tom models and is attached via strips of Velcro to each snare basket arm. We're testing the products with a 14"x14" floor tom and 14"x51⁄2" snare drum. Both drums are 100 percent maple and have a naturally warm tone and, in the case of the floor tom, a bucket load of sustain. Before using the Little Booty Shakers we were (and still are), quite happy with the overtone on this snare. We were a little concerned we would have to get a slice of Moongel but this seems counterproductive. Before we put either of the Shakers in position, there are a couple of wallops needed to acclimatise our ears to the natural sound of the drums. Lowering each foot into the Shaker is all that is required to attach them, then it's the turn of three Little Booty Shakers which are attached to the rubbers of the snare basket assembly. The basket aperture is widened slightly to accommodate the snare but fortunately, it still feels secure. After a few hits we cannot detect any increase in resonance but the snare drum appears to be more gutsy. The floor tom seems particularly beefy and, though we have never had the desire to coax more resonance from this either, it does seem almost unstoppable, which perhaps will help with projection. In particular, the lower end with the energy being transferred through the ultra-wide feet of the floor tom with the Booty Shakers and down through the snare stand with the Little Booty Shakers.